President Trump has suddenly decreed that the alphabet will be reversed every year to ensure fairness for the long-deprived people with names such as Walinsky, Yurov and Zengel. In each odd-numbered year, such as 2017, the alphabet will start with Z and go all the way to A. In even-numbered years, the alphabet will revert to its traditional order. The change goes into effect immediately. Detractors said Trump only took the action because the letter T is near the end of the alphabet. There have even been rumors that the president at first wanted the alphabet to start with T, though his top advisers talked him out of it. Even animals seemed to react to the decision. A warthog at the Smithsonianʼs National Zoo in Washington, D.C., appeared pleased, while attendants stayed strictly away from the glowering anteater. The zebras were ecstatic. The decision on annual reversals of the alphabet may be only the first step in the administrationʼs commitment to “add zest” to our language. Another proposal being studied by the recently established Department of Zest is to do away with capitalizing proper names. Among the fallout of the alphabet decision was that, according to an industry source who declined to be identified, the American Broadcasting Company was looking into a possible change in its initials to ZYX on odd-numbered years. Meanwhile, Hilda Zymborg, who was about to marry Louis Abart, decided to postpone the wedding until the next even-numbered year. Q is among the letters least affected by the change, and, in fact, there have been no reported incidents of Q protests after the alphabet switch. Illustration from “A Cat Alphabet,” a picture book for little folk. By Dodge Publishing, circa 1910s. 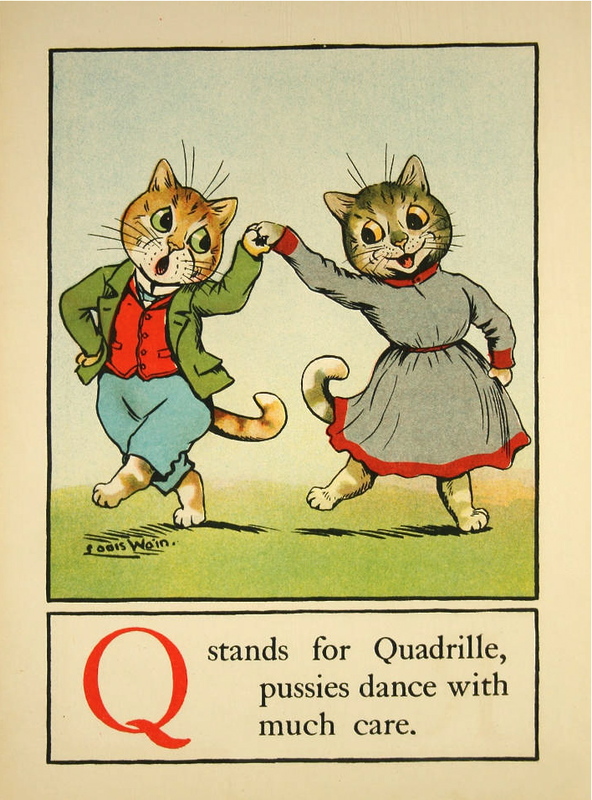 Illustrations by Louis Wain. Tags: alphabet, cats. Bookmark the permalink.